The Behringer X32 Digital Mixer is a huge leap forward for digital mixing. This board brings together unbeatable sonics with vast functionality, all in one elegant and easy-to-navigate interface. It sports 32 individual audiophile-grade microphone preamps and line inputs, 40 total channels of processing, and 16 balanced XLR outputs. It hooks up to your computer and preferred DAW through a standard USB interface, ensuring ease in the most complex live or studio situations. The layout is intuitive and thoughtfully designed, allowing you to move quickly between channels to adjust dynamics, EQ, or FX "on-the-fly." Equipped with a library of top-notch FX and a fully expandable I/O, this all-in-one unit may well be the only mixer you'll ever need again. - Dugan-style Auto-mix on first 8 input channels. - Crossover filters added to main left/right mix and main mono bus. - Phase inversion added on routing page to all outputs. - X32 Edit can go full screen. - X32 Edit can open multiple windows and use multiple screens. - X32 Edit now has two user definable banks of faders. The board sports MIDAS-designed mic preamps on all 32 inputs, yielding clean sound without the need for any external preamps. On top of that, the Virtual FX rack offers 8 true-stereo FX slots on each channel, with high-end simulations of celebrated units like the Lexicon 480L, PCM70, EMT250, Quantec QRS, and more. Plus, Behringer has promised that new FX inserts and firmware updates will be available free of charge through their website. The X32 leaps beyond other digital mixers with its dedicated custom control section. This section comprises 17 backlit buttons and 13 rotary controls (all user-definable) with LED collars so you can make quick, precision adjustments to each channel's FX, compressor, 4-band parametric EQ, etc. Each channel in turn has its own LCD strip for monitoring input and FX. Finally, a high-resolution 7" color TFT display makes it easy to visualize whatever aspects of the workflow you need to keep an eye on. Oh, and if that's still not enough visual space for you, just download the free XiControl iPad app to monitor and control the X32 wirelessly with up to 10 individual iPads. Musicians on stage can finally take care of their own monitor mix and output levels in real time! The Behringer X32's scene management setup creates exact presets out of your own custom mixes, allowing them to be saved and instantly recalled for future use. The 100 mm motorized faders on channels 1-16 bring your presets back with the flick of a single switch. And when you want to make adjustments recalls on channels 17-32, just hit the Flip button. In 2009, Behringer's parent company acquired Klark Teknik -- and the X32 is the happy result of this brilliant technological marriage. The X32 is 48-channel digital snake ready via two AES50 ports, which use Klark Teknik's SuperMAC networking capability to connect with existing snakes with virtually no jitter or latency. These ports allow the board to connect directly to an onstage or studio snake, for a total of 96 possible inputs running from an external box! System expansion goes even further via an integrated card slot, allowing you to add up to 32 channels of digital audio via IEEE1394 FireWire, ADAT, TOSLINK, or USB. With the X32 Digital Mixing Console, Behringer has set a new standard in the sub-$5K market. With its impressive sound, vast library of FX, and massively expandable I/O, the X32 presents an exciting and dependable choice for anyone looking for a digital mixer reflecting a considerate and innovative design. - Virtual FX rack featuring 8 true-stereo FX slots include high-end simulations such as Lexicon 480L and PCM70, EMT250 and Quantec QRS, etc. Do I Need an Expansion Card? All recent X32 models come with the X-USB card, which offers USB only, as FireWire is fading in popularity. If you need FireWire features, you can swap in the X-UF expansion card, which offers USB and FireWire in one card. The X-MADI and X-Dante and X-ADAT expansion cards offer more connectivity options not offered on the included card. Ever since the "dawn of digital" audio engineers the world over have had a love-hate relationship with their consoles. 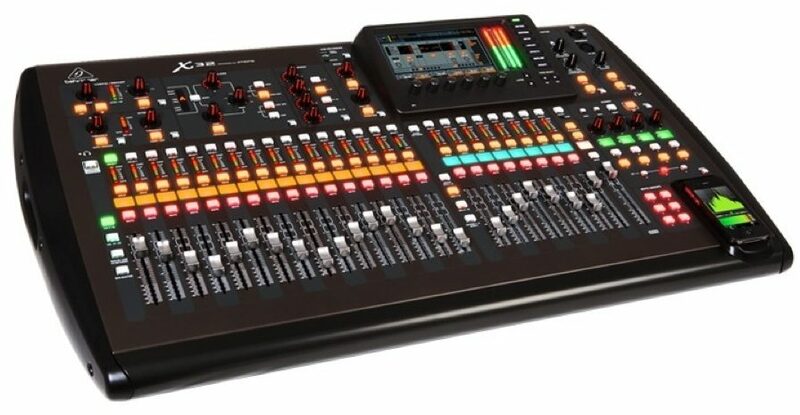 The BEHRINGER X32 digital mixing console lets you focus on your event, instead of navigating a vast sea of knobs, buttons and menus like most other live digital mixers. X32 is intuitive and powerful with 40 processing channels and 25 mix buses, all equipped with serious signal processing (dynamics, EQ and inserts), which can be configured quickly to meet the demands of virtually any gig, large or small. Use any combination of the local 32 console mic inputs or the networked digital snake inputs on stage--their audiophile quality programmable preamps always ensure full control, purity and impeccable dynamics. The dedicated channel strip section puts 17 backlit buttons and 13 rotary controls with LED-collars right at your fingertips for nuanced adjustment of each channel's compressor, 4-band parametric EQ and much more. Each input and output channel strip features its own color backlit 128x64 graphic LCD, which provides vital channel information at-a-glance. The onboard virtual FX Rack provides access to eight true-stereo, multi-effects processors (16 mono) including delay, chorus, dynamics--and it can run 4 production quality true-stereo reverbs concurrently with 8 channels of 31-band graphic equalization, all without the need for expensive, space-consuming external hardware. I/O abounds with 32 high-end programmable mic preamps; 6 Aux Inputs on 1/4" TRS; 16 balanced XLR Outs, plus balanced Control Room outputs on both XLR and 1/4" TRS connectors. A single CAT5 cable from FOH to the stage can receive up to 48 channels of audio input--and deliver all bus outputs, along with 16 individual monitor feeds for BEHRINGER's P16 personal monitoring system. Signals can be assigned to eight DCA groups (Digitally Controlled Amplifier), which provides simultaneous group level control via dedicated 100 mm motorized faders. The audio engineer can communicate with the talent by means of the Talkback section's onboard mic or an external mic of their choosing. X32's scene management allows snapshots of high-level production mixes to be captured and recalled for future use (you can even save them to a USB stick). 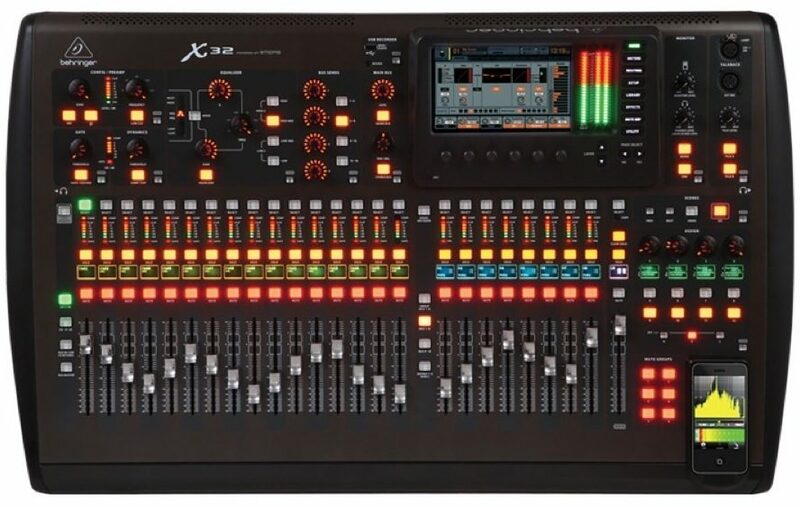 X32 even has a dedicated custom control section with user-definable knobs and buttons where you can create your own set of controls, making it easy to access frequently used functions "on-the-fly." The rear panel also sports two AES50* ports, each with Klark Teknik's rock-solid SuperMAC 48-channel I/O networking capability (for addressing a total of 96 inputs and outputs). Stereo digital output and MIDI are also supported, as well as ultra-low jitter, ultra-low latency communication between the X32 and digital snakes, remote stage boxes and outboard recording devices. A convenient top panel USB port is available for recording an uncompressed two-channel "board mix" straight to any standard USB thumb drive or for playing background music. System expansion and connectivity capabilities are provided via an integrated card slot, which allows you to add up to 32 channels of digital audio I/O by way of IEEE1394 FireWire, ADAT TOSLINK or USB. It will even support standalone 16-channel uncompressed multi-track recording to an attached USB drive -- without requiring a computer! The X32 comes with the X-USB card installed. The BEHRINGER X32 digital mixing console sets a benchmark for live sound mixing along with unprecedented value. Never before has any manufacturer offered a full-featured digital mixing console with such large input and output channel count, comprehensive processing, flexible expansion options and an intuitive user interface -- all at a price point that has the competition shaking in their boots! Thanks to the netbook-resolution, 800x480 high-contrast color TFT display, you are never more than one or two button presses away from any of X32's eight highly intuitive control screens. Once you select the desired function, dedicated rotary/push encoders allow you to set parameters and source I/O assignment, without the need to 'drill down' through multiple layers of menus or page through a complex owner's manual. - Virtual FX rack featuring 8 true-stereo FX slots include high-end simulations such as Lexicon 480L* and PCM70*, EMT250* and Quantec QRS* etc. Overall: Not much more to say except for loving it in the studio! Overall: This is long anticipated unit that does everything very well, sounds great, and at a very reasonable price. I use it every week, and it does everything well. With the new FW 2.02 it just got even better, a whole new collection of FX, great RTA, and few other things added. Music Group really has been working hard at this one, and it beats any competition.